You'll be £10.00 closer to your next £10.00 credit when you purchase The Passchendaele Campaign 1917. What's this? This is an account of the British Expeditionary Force’s battles in the summer and autumn of 1917. It begins with the Allied plan to free up the Flanders coast, to limit German naval and submarine attacks on British shipping. The opening offensive began with the detonation of nineteen mines on 7 June and ended with the capture of the Messines Ridge. The main offensive started with success on 31 July but was soon bogged down due to the August rains. Three huge attacks between 20 September and 4 October had the Germans reeling, but again the weather intervened and the campaign concluded with futile attacks across the muddy slopes of the Passchendaele Ridge. Each large battle and minor action is given equal treatment, giving a detailed insight into the most talked about side of the campaign, the British side. There are details on the planning of each offensive and the changing tactics used by both sides. There is discussion about how the infantry, the artillery, the cavalry, the engineers and Royal Flying Corps worked together. Over sixty new maps chart the day-by-day progress of each battle and action. Together the narrative and maps provide an insight into the British Army’s experience during this important campaign. The men who made a difference are mentioned; those who led the advances, those who stopped the counter-attacks and those who were awarded the Victoria Cross. 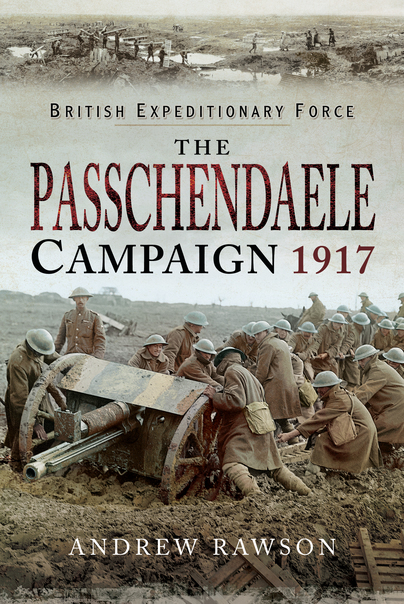 Discover the Passchendaele campaign and learn how the British Army’s brave soldiers fought and died fighting for their objectives. Superb overall account following the fortunes of the entire BEF through the Summer and Autumn of 1917. A very useful account of how the fighting progressed, giving the reader a very good grasp of what happened on the ground each day. The publication of Andrew Rawson’s comprehensive account of the 3rd Battle of Ypres of 1917 not only fits in well with much of the literature published to commemorate the centenary of the British offensive in Flanders, but also serves as a meticulous record of the major engagements and minor actions which made up this pivotal battle. The publication of Andrew Rawson’s comprehensive account of the 3rd Battle of Ypres of 1917 not only fits in well with much of the literature published to commemorate the centenary of the British offensive in Flanders, but also serves as a meticulous record of the major engagements and minor actions which made up this pivotal battle. In gathering detailed records of many aspects of the offensive from the British viewpoint, backed up with impressive maps of every stage of the battle, Andrew Rawson has produced a work which will be of interest to all those who wish to study the experience of the British Expeditionary Force in this controversial campaign. From the outset of the book, Regimental abbreviations are provided as a constant reference as one reads the detail in the book. An excellent introduction in the book sets the scene, putting into context the various work that has been done on the battle, including the Military Operations in France and Belgium, as well as various Divisional Histories. In turn, he makes clear that a comprehensive study of the campaign would be twice the length of the book. To that end, he had to judge at what level of detail to pitch information in so far as there is nothing new to learn if it is 'too shallow', but also it came become overwhelming if it is in 'too much detai'l. The author has succeeded in both aims brilliantly again. The book is complimented by great photographs. All are so very poignant, but a particular favourite shows a light railways carrying men and material to the front line. Another shows a team of horse struggling to haul an 18 pounder gun through the mud. What is also useful is the size of these photographs, each taking up half a page. Too often, books try to cram in too many photos to the extent that they lose impact due to a smaller size. The book finishes with the conclusions of the campaign as well as the tactics and weapons. He reminds us that the British Expeditionary Force had only advanced 4 1/2 miles by the time the campaign closed. The Germans still held the Belgian ports. Conclusions on the campaign and an index round off the text of this excellent publication. An in-depth account of the campaign that has come to symbolize the horrors of the Western Front. Excellent account supported by first rate maps through the body of the book and an evocative photo-plate section – Highly Recommended.